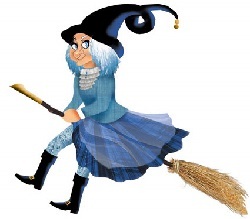 Also, popular tradition avers that if one sees La Befana one will receive a thump from her broomstick, as she doesn't wish to be seen. This aspect of the tradition may be designed to keep children in their beds while parents are distributing candy (or coal) and sweeping the floor on Epiphany Eve. Legend has it that she was an old Italian grandma-type happily cleaning her house, when three men showed up at her door. No fool, she was skeptical. She shooed them away when they said they were searching for baby Jesus, the newborn king. After a little while, she had second thoughts. Perhaps, the men were honest and telling the truth. If so, she missed her chance to help them reach the king. She decided she should try to catch up with them. But they were long gone. So, she handed out gifts to all of the children in the neighborhood in the hopes that one of them was Jesus. Every year she goes to look for the three wise men - and most importantly baby Jesus. When she does, she leaves little surprises for the little Italian girls and boys. Some say she didn't go with the wise men because she had chores to do. Others believe she promised to find them after she finished the housework. Still others have an entirely different version of the story. I've also heard that La Befana was a mother to a son who lived in King Herod's day. Herod reportedly decreed that each male child born was to be killed because one of them could be the new king. La Befana was so traumatized when her son was murdered that she didn't believe he was really killed. She set out in search of him carrying all of his belongings in a sack. She quickly aged from worry - her face became wrinkled, her hair turned gray and she grew to look like an old, haggard lady. She finally found a male baby in a manger and she laid out her son's belongings at the baby's feet. The baby was Jesus Christ. And He blessed the lady as "Befana," the giver of gifts. After that, every year on Jan. 5, the eve of the Epiphany, she would be mother to all of the world's children and would care for them by bringing them treats. I personally prefer to believe that last story is the truth. Who can't feel for a grief stricken mamma? What a lovely thought that a woman who lost her baby can turn her sadness into an excuse to nurture all children, including Jesus. But you can pick your favorite legend and stick with it. That's the beauty of La Befana.